We are currently looking at reworking one of our web-apps. At the moment, all editing is done in modal popups. It would be simple enough to replace a single modal with an inline edit mode or something. However, our app presently allows multiple levels of dependent data to be entered at the same time. One of the fields on the new journey form is to select which client is travelling on that journey. The field shows the currently selected client (probably blank) and a "Select" button, which opens a popup to select the client. This popup has a list of available clients to choose from, and a simple search box to narrow down the results. However, as you can see they can also add a new client from this window. If they click "New", it opens the "New client" popup. One of the fields on the new client form is to select the surgery/doctor for the client. Again, there is a "Select" button which will open a popup to select the surgery. It looks much like the select client popup. If the surgery is not already in the system, there is another "New" button, which opens the "New surgery" popup. As they click Save/Select on each popup it will close and fill in the appropriate field on the popup underneath, until they get back to the first popup. When they save that, the system goes to the screen for the journey they just created. Is there any alternative approach that does not use popups? Or are popups the best tool for the job here? 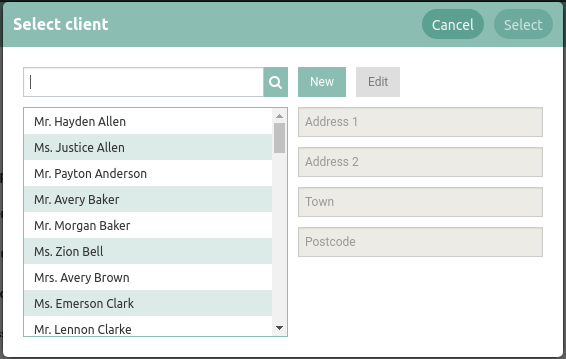 Click "Add New" next to any drop-down causes a small form to appear in-line with the current flow and disables drop-down. Not the answer you're looking for? Browse other questions tagged forms popup modal-windows edit or ask your own question.